In the spring of 1994, eight students at the State University of New York at Albany gathered to discuss the issue of establishing a strong Asian-interest organization on campus. The men aimed at tackling a number of goals, namely spreading Asian-awareness on the university campus and building a strong bond of brotherhood between the individuals. 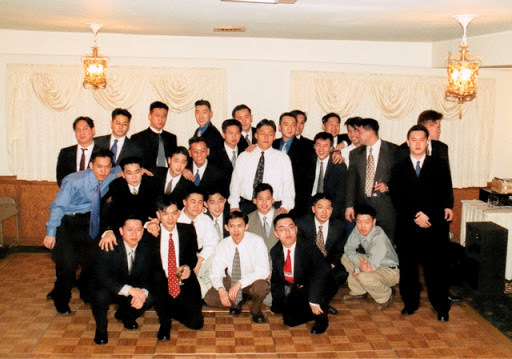 These eight men elected amongst themselves one man, Albert Yip, to be the primary founding father, and on March 18, 1994, Nu Alpha Phi was founded. Together, these eight men persevered to create the fundamental learning process that is still used to this day for all prospective members. The major intent of the process was to instill the Seven Principles of Brotherhood, Discipline, Leadership, Pride, Professionalism, Service, and Unity into members’ everyday lives. The Founding Fathers’ belief was that it was through this process that they proved to one another – as well as to future members – that their bond would withstand any hardship. The fraternity professes to create a bond of brotherhood passed down from generation to generation, including lasting relationships between alumni and currently active members. Externally, it seeks to promote Asian-awareness, as well as to serve as a liaison between the Greek community and the Asian community. This is done through a supportive network of alumni and matriculated brothers who actively engage in participation in community service, cultural workshops and events, university programs, and various other on-campus student activities. Additionally, the fraternity strives to work with various other Asian Greek organizations in an effort to bring unity and recognition to the Asian-American community. Every other fraternity speaks of “eternal brotherhood.” However, Nu Alpha Phi Fraternity, Inc. is the one that shall attest and live up to this challenge. Unlike many organizations, we do not operate as just a group of individuals bound by rules and systems. Though we uphold features of being a legitimate corporation, we treat the terms “Brothers” and “Brotherhood” with utmost sincerity and as literal as we can possibly make it happen. Though we are steadily increasing, we do not pride ourselves shallowly on numbers, but in remaining true to the fundamentals that the Founding Fathers have passed down to us, being exclusive to those who truly deserve to belong to such an outstanding group of men, those who are accurate representations of our Seven Principles, and those who really have a powerful urge to don and represent the Greek letters that we deem sacred. We are expanding with the objective to welcome prospective members to have an opportunity to be proud of something like never before in their entire lives. We consider it a great privilege to have a chance to both enhance your experience as a college student and also be a part of an entity that will go beyond your college years, a genuine Brotherhood for life. It is our guarantee that you will grow to be an evolved individual after the process, with more zest for life, more confidence in being a leader, and more self-assurance as you will view that no obstacle in life is impossible to overcome. You will enjoy yourself and your social network will grow in unprecedented measures.